The Mountains to Sea Trail (MTS) is 930 mile trail that consists of foot paths, roads, and bike routes. 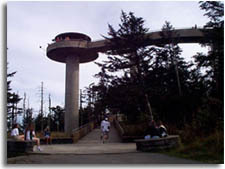 The trails Western terminus is Clingman's Dome, elevation 6643 feet, in the Great Smoky Mountains National Park. the MTS follows the Appalachian trail for 3.5 miles before crossing Clingman's dome road and heading down the mountain. The MTS trail traverses the state ending at Jockey's Ridge State Park, elevation 140 feet, near the Atlantic Ocean. The MTS winds through three National Parks and seven state parks. There are currently about 400 miles of trail complete and the MTS within the Great Smoky Mountains is complete. Copyright © 1999 - 2005 Southeastern Outdoors a Division of Southeastern Computer Services.